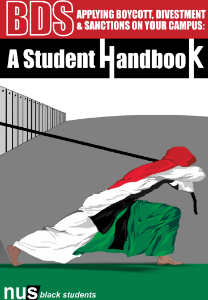 This handbook is designed to be a practical tool for activists who are setting up local BDS campaigns. This handbook is designed to be a practical tool for activists who are setting up local BDS campaigns. We hope that it will give activists the political and practical means to launch local BDS campaigns, to argue for solidarity with Palestine, and to achieve victories on their campuses and within their communities.